Just casually finishing a sub-3 in 30* windchill. It’s time for the 2016 Running Year in Review, already. Man, this year flew by. It seems like just yesterday that we rung in the New Year. I started the running year with some ultras, a marathon, I thought about triathlons (because why not? ), and then back to running. Everyone has a plan until they get punched in the face. I made some modifications. I had some long, unplanned breaks. But at the end, I learned a lot. 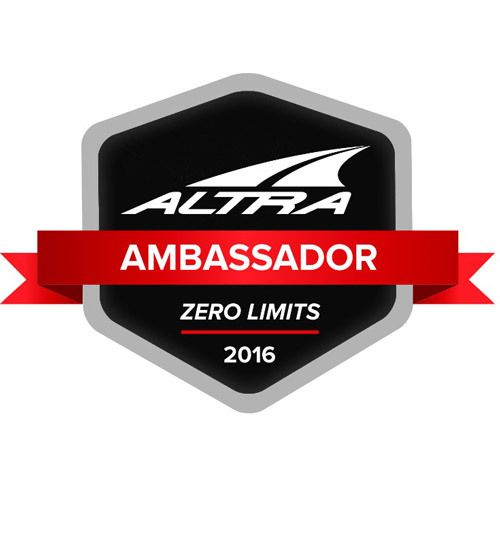 Early in December I learned I became an Altra Ambassador. I honestly didn’t think I’d get it. I saw an application posted on Facebook and thoughts why not? What’s the worst that could happen? The acceptance emails arrived the first week of December. 2016 year was awesome just being involved and around the Altra community. As someone who’s been in the startup industry, I find growing and expanding companies fascinating. This year we added a lot of clothing to the line, and an increase in the number of footwear options on the market. The enthusiasm of the Altra community is fantastic! Altra is unique in design of the shoes: FootShape for your toes and zero drop, which is perfect for forefoot landing. People who start to wear Altra end up only wearing Altra. It’s not #basic Nike shoes, which I only can image people wear because they’re sponsored or like looking like everyone else. It’s really the running community that makes running so awesome. There are people I’ve just met, and after talking about running for a few minutes become best friends. That’s what it felt like with Altra. My favorite models: Altra Paradigm and Altra Instinct. January and February featured the Rocks and Roots 50K and 50M. After completion of both, we’d earn a buckle. Yes, an ultra buckle (although R&R are the easiest trail ultras you’ll run; they’re about as technical as running up a 20 foot incline and a billion switchbacks). January featured my second 50K in five weeks. It snowed during the race. It looked like a winter wonderland. Afterward, it became a mud track. It doesn’t help there are also 10K, 20K, 30K, and 40Ks going on as well to wear out the trail. A 12:00 pace seemed like a 6:00 at that point because of the lack of traction. I finished in 6:39. A couple finished a loop just after I completed the race (the race series are 10K north and south loops, alternating). They’d have to DNS because they missed the cutoff as they had one more loop to go. The next month, only four weeks later, was the 50M. Long story short, don’t get sick during race week. I was done about 18 miles in and DNFed. The weather on Super Bowl Sunday was magnificent though. The race started at 0600, which meant headlight time. It’s surreal running with a headlamp in the frost. I remember crashing on frozen mud once or twice and talking with a guy for a loop. I have a 50M next year to make up for it. based on weather. After recovering from the 50M DNF, I had a whole five weeks of training before taper. Training went exceedingly well, although I wished I had more time. 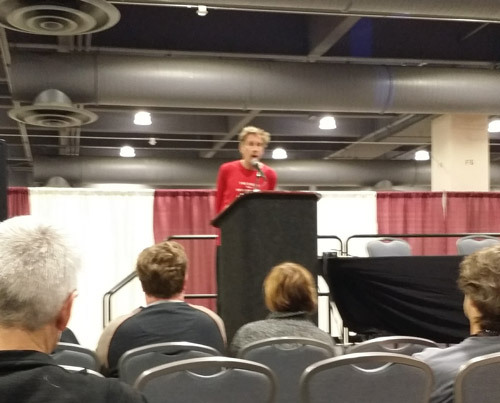 I think about this time I realized that you can’t train for fast marathons while running one per month, which meant that I decided I’d only do two per year in the future. I had a three week taper, which was one week too many because I was a little flat for the race. The race was a nice day — high 50s, sunny, with a slight breeze. I did find it a little warm at the end. About three miles toward the end of the course I ran with a woman who’d run the 5K earlier and now ran the final leg of the marathon relay. As we ran we went by her home, as she’s a local. I finished the race in 3:03.44, which qualified me for Boston. I was happy with that, but felt flat enough I think I would have been closer to 3:00 on a good day. I went from 4:15 to 3:03 in 18 months. I missed the cutoff for Boston 2017, which saved me a couple grand, ha. I registered for the Half Ironman in Delaware, Ohio, in October for the August race. I decided I like running more than cycling and having to swim. YOLO. The recovery from Glass City killed about a month of my training in May. Last fall it only took about a week of recovery before I could get back to training, but here it was far longer. I don’t train via heart rate, but I wear a monitor to check trends. When you lack endurance and your HR is high, that usually means you need more recovery. For several weeks I’d run Monday and Tuesday, then decide I needed more time off for recovery. I didn’t run a full week until the first week of June, and the marathon was April 24. June was kind of a funk as well. Lack of motivation, although I’m not sure why. Maybe my body getting used to the heat, since it was cool the last I trained months earlier? Regardless, I started to run 90s when the next setback occurred. What my bruised knee looked like. A week later. I had a Wednesday in late July in which I could sleep in. Often, sleeping in feels like a rest day. I went out for a 16 mile MLR. My legs felt light and rested as I ran down the hill next to my condo. I cut to go from the road to the side walk. I tripped. I went airborne. I landed on my stomach and knees, sliding, knocking my wind out. A lady across the street asked if I was okay. I gave the thumbs-up, as that was all I could do. I got up, walked it off, and continued on my run, which only just began. Looking at Strava, I didn’t even think on that Wednesday I had hurt myself. The next day I realized my knee wasn’t alright. I ran .1 mile then packed it in. It felt like Groundhog’s Day that I’d take a week off, I’d run on Monday and maybe Tuesday, then take the rest of the week off and try again next. 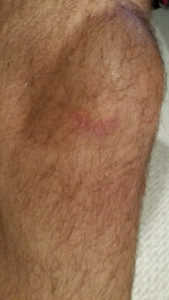 I had bruised my right patella. 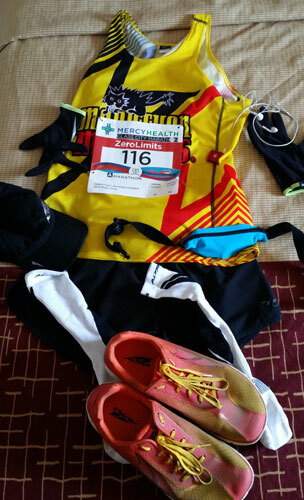 The last week of August – the week of the Emerald City Half – was the first week I could run. I wouldn’t be able to race it, but I could run it. I ran it in 1:35, which was okay for the circumstances (it was “red flagged” because of the 70* temp at the start; I guess Badwater gets the Jolly Roger). The good news was my knee could take it! The pain was all gone a few days later. Two October halfs: Broke Man’s the 2nd and Columbus the 16th. Because I lost time and wanted to “experiment” a bit, I would run the Broke Man without taper and just go right into it. Going right into it meant running 82 miles that week, with 8 on Friday and 10 on Saturday for the Sunday race. The race only cost about $30 to enter, so it definitely wasn’t an expensive, goal race to totally prep for. I learned that you should probably, optimally have a one week taper, even for a half. I had enough of a cold that week that I had a little residual fatigue, and four switchbacks aren’t fun during a race. I finished 5th OA in 1:27.02, which currently stands as my PR. 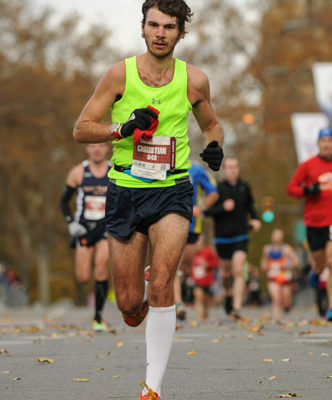 I retired my Marathon Maniacs singlet because I never ran a good race with it. Bad luck. I totally nailed the Columbus Half Marathon. Totally. So much so that I thought I felt that I should go out guns-a-blazing and run a 19:09 5K between miles .3-3.4 – literally PRing that distance – and crashing to only a 1:28.45 (I ran mile 3 in 6:08, which is on pace for 1:20.30). I decided that week that if I felt good I’d go for it. But I totally nailed the taper, nutrition, rest, et cetera. That week I ran 6-7.4/3.2-R-8-6-4-Race. A rest day Wednesday worked out well because I wanted one day of actual rest – since I don’t schedule rest days, they come when they come – but didn’t want it the day before the race. A few easy days preceding the race. Enough to get the legs moving, but not create fatigue. Again, I didn’t consume anything during the race. That atmosphere with “Thunderstruck” though. I can’t wait for next year’s half. I want revenge on it. 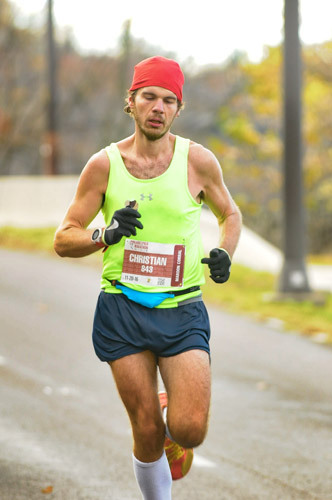 How I looked about 17 miles in during the 2016 Philadelphia Marathon. 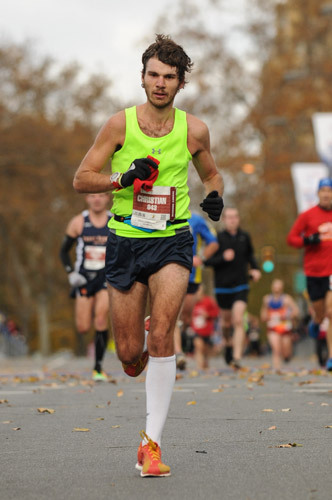 Five weeks later stood the Philadelphia Marathon. I chose this because if I had run the half Ironman, I wanted enough time for a little cycle. Seeing as how the summer was so-so, it because that anyhow. I didn’t need time to recover from the three halfs, because apparently I don’t need time for recovery for races shorter than a marathon. I added a second quality day it. It at least got me used to running faster. I basically had two weeks of training, two weeks of taper – 77 and 61 miles – before the race. I’ve never visited Philly until then. It, was, awesome! I never thought about the historic significance of Philadelphia. I chose the race because of proximity to Columbus and time of year. My mom went, and she had a ball as well during the weekend race getaway. The race’s weather was perfect overcast and high-30s/40, but windy with ~40 MPH gusts. The wind arrived the night before when you could see flags flying parallel to the streets. I accepted whatever result I ran. I dressed like it was 80 though, with a hat a gloves, because your body is a machine and doesn’t like heat, especially when running a <7:00 pace. I went out fairly easy because I knew the worst of the wind would be the second half by the river. I saw my mom near the 10K and half marks of the course. It was awesome seeing her twice. She took pictures of me passing her the second time she saw me and posted them online, so people could see pictures of me while the race was actually going on. I broke three: 2:59.34. The execution of the race was perfect (even with only two gels and little water). I definitely lost time with the wind, but how I prepared and ran made me happy and something to build on. We can’t control the weather. I did get to visit – during a run – my first Ivy. Ueber consistent, one may say. Statistically, I averaged ~50 MPW, but really it was >85 when I was able to run. Now, I’m sitting at my computer on December 23 calling it a day for 2016, to give my tendinitis time to (hopefully) completely heal for 2017. I can run on it, but can’t train. I might as well keep myself on the DL. I wanted four months to train for next April’s marathon, and now I’ll have only three. Life happens when you make plans. I PRed my half and marathon this year. Although I believe I was in 1:23 and 2:55 fitness, races don’t always show your true fitness. I ended with two very well executed races, well other than the pacing of my Columbus’s half… Last year I made improvements to train and races by leaps and bounds. This year I didn’t do that, but I did learn by leaps and bounds, even if the stats don’t show it. You live and you learn and that’s exactly what this year was. That’s supposed to be Bill Rodgers. Author’s Note: This was supposed to be published days ago, but because of Error 504s and 111s, it had to be pushed back. But in the meantime, I found out that I’m an Altra Ambassador for a New Year!! e-newsletter service. Do you’ve any? Kindly let me recognize so that I may subscribe.